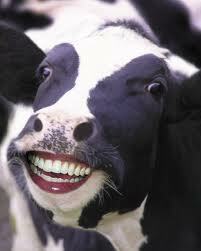 Do you ever think about the kind of lifestyle your cow or chicken had before it ended up on your plate? Well wonder no more... 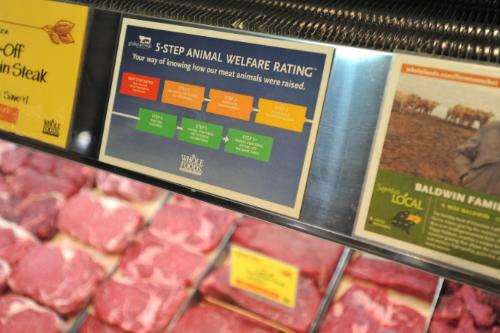 Whole Foods has come up with a way to keep you informed about how your meat was treated, what kind of lifestyle it had and where it was raised... sort of weird, right? Well, it sounds like it could be extremely interesting; however, it's actually a confusing and only somewhat helpful system. Called an "Animal Welfare Rating System,"in which it rates the upbringing of pigs, chicken, and cows on a scale of 1 to 5. The program is lead by the Global Animal Partnership, a company that is dedicated to making lives of farm animals better. OK, so what exactly are you going to find in the meat aisle at Whole Foods? Well first, you'll notice colorful stickers with a rating of 1-5 on all meat products (along with new, annoying, and somewhat unappealing packaging). Level 1: No crates, no cages, no crowding- they all have some elbow room and can spread their wings. Level 2: Enriched environment- they have a bale of hay to rub up against or a gadget to play with when they want to. Level 3: Enhanced outdoor access- this means that your pig or chicken was allowed to go outside and lay in the sun. Level 5+: Animal centered; entire life on the same farm- they have all the perks of level 5, but never had to pack up their things and move... they have been entirely catered to, and they were comfortable until they reached your plate. So... though this is interesting, what does this actually tell us? I'm not sure, other than the fact that we know they are not antibiotic fed, and they have no hormones (but thats why we buy from Whole Foods in the first place, right?). This system doesn't seem to alter the calorie or nutrient content of the food, like adding salt or sugar does, so other than knowing that your animal was treated well, it doesn't seem that you will have any added health benefits outcomes from buying a package with a label "5" on it, other than the fact that to you, it might taste better. So all in all, because we can't expect to be truly healthier, just more humane- which is a great thing, from buying level 5 meats-I think the best we can expect from this, is just knowing that the chickens, cows, and pigs were healthy and happy before we saw them on in the refrigerator at whole foods. Additionally, look for more colorful packaging!